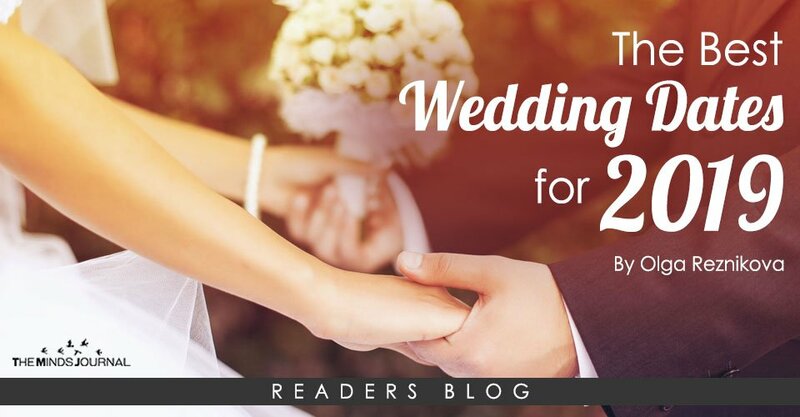 Picking the right wedding dates 2019 banks on a lot of factors and significance that can make or mar the day. As a result, couples tend to have difficulties deciding on the right dates. It is common knowledge that June, September, and November are popular wedding months, as such always overbooked. Most couples make the mistake of picking the same dates as notable events, leaving their wedding venue empty. This post will show you other great months with perfect dates, cooperative weather, and the right ambiance! Find all the information about your lucky months and numbers below. Lucky dates: March 3rd and 21st. Why they are lucky: These dates symbolize good luck. A period when it is believed that the super moon will shine over the earth, bringing good tidings. At this time also, weddings are cheap and you can get your best vendors. Why they are lucky: Matching even numbers 04/04 is perfection. Those are lucky numbers and asides that, it’s spring with nature at its most supreme glory. The greenery emphasizes all the joy and hopes you feel. Why they are lucky: The weather is very mild, the spring continues and adds more beauty to the natural greenery. These parade of nature sets the scene for a romantic wedding. One you will never forget. Why they are lucky: The power of perfect numbers cannot be over-emphasized with June 6th. June, a popular wedding month has stable weather, and the warmth of summer is everything a bride dreams of. It’s picture perfect! Why they are lucky: 7 is the number of perfection, hence 7/7 is a lucky date. It is believed to be a sign of good luck. It is also summer which is warm. A time for relaxation, holidays, blue skies, blooming flowers, and the perfect wedding pictures! Lucky dates: August 8th and 12th. Why are they lucky: This is the time of vacation for children, so they can travel with their parents. A time of summer warmth and long days with shorter nights. You can party all day and the sun will never set. Why they are lucky: This is autumn with many flowers of diverse colors in bloom. A romantic wedding month that leaves you spoilt for choice of flowers colors. You also get to enjoy the beautiful natural lights of the skies and stunning photos with breathtaking natural backdrops. Why they are lucky: Weddings in October are cheap because it is normally not a popular wedding month. This is also autumn with its calm weather and air. We cannot skip its beautiful natural lights and bright evenings.